Michael Sterthous is a partner with Whiteman Osterman & Hanna's Environmental; Real Estate Development, Zoning and Land Use; CleanTech; Energy and Telecommunications and Municipal Practice Groups. 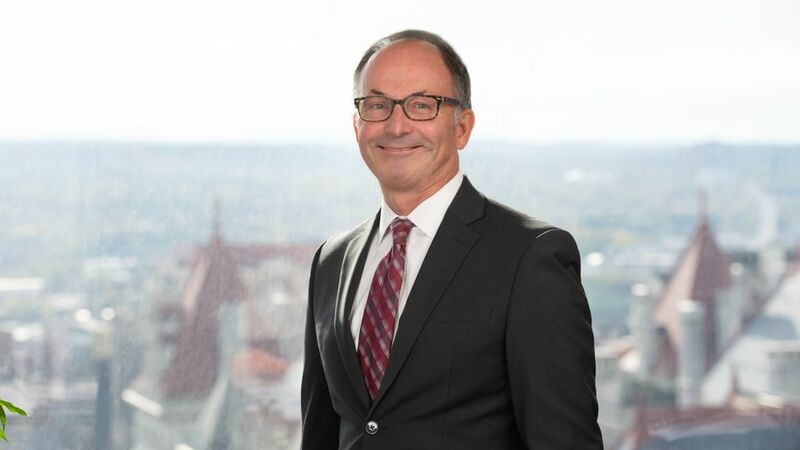 His primary practice areas include regulatory compliance and enforcement; brownfield redevelopment; environmental impact assessment, land use, planning and zoning; federal, state and local permitting; and environmental litigation. Provides State and federal brownfield program guidance for several private and public redevelopment projects throughout the State, including Environmental Restoration Program sites for municipal and local development corporations. Manages environmental litigation and administrative enforcement matters for large and small industrial, commercial and municipal clients, including in the areas of federal and State Superfund laws; NY Navigation Law; chemical and petroleum bulk storage; solid and hazardous waste management; stormwater management; public water supplies; and sewage treatment facilities. Special SEQRA counsel to: (i) the NYS Office of General Services/redevelopment of the Harriman State Office Campus; (ii) NYS Division of Lottery/Yonkers Raceway video lottery terminals; (iii) NYS Thruway Authority/rest area expansion; (iv) Village of Kiryas Joel/NYC Aqueduct connection, 13-mile water pipeline, and treatment plant; (v) Tompkins County/cell tower public safety communication system; (vi) Town of Ticonderoga/WalMart Supercenter; and (vii) Town of Cape Vincent/wind development projects. Counsel for significant annexation proceeding, including SEQRA compliance, overall public interest determination and successful defense of legal challenge. Village of S. Blooming Grove et al. v Village of Kiryas Joel et al. Index No. 7410/2015 (Supreme Ct. Orange Co. Environmental Claims Part, Oct. 11, 2016). Lead counsel in Town Law Article 5 proceedings for the formation of the first new town in NYS in over 40 years. Co-trial counsel for defense of CERCLA cost-recovery action resulting in zero sum judgment, Seneca Meadows, Inc. v. ECI Liquidating, 427 F. Supp. 2d 279 (WDNY 2006). Represented Sierra Club before the New York Court of Appeals, Adirondack League Club v. Sierra Club, et al., achieving an expansion of the navigational servitude on State inland waterways. Secured approval for 20 MW wind power generating facility in Clinton County. Successfully defended respondents in WBNA v. ZBA of Town of Beekerstown and Windhorse Power LLC, 53 A. D. 3d 954 (3d Dep’t 2008) and WPEG v. Town of Cape Vincent, 60 A.D. 3d 1282 (4th Dep’t 2009) establishing wind power generating facilities as public utilities for zoning purposes. Negotiated and closed on over 15,000 acres of conservation and agricultural easements, including in the New York City Watershed; representing both private land owners and several land trust organizations on acquisitions, land stewardship/enforcement, including the Watershed Agricultural Council; Adirondack Land Trust; Lake Placid Land Conservancy; Edmund Niles Huyck Biological Research Station; and the Catskill Center for Conservation and Development. Represented a number of State and local authorities including (i) New York State Thruway Authority; (ii) New York State Canal Corporation; (iii) New York State Dormitory Authority; (iv) New York State Division of Lottery; (v) New York State Office of General Services; (vi) Schenectady Metroplex Development Authority; (vii) Catskill Watershed Corporation. Mr. Sterthous is admitted to practice in New York, New Jersey and Pennsylvania. He is a member of the environmental sections of the American Bar Association and New York State Bar. He sits on the Board of Directors of the Pace Environmental Litigation Clinic, Inc. and the E.N. Huyck Preserve and is a member of the Advisory Council for the Mohawk Hudson Land Conservancy. “New York’s New Brownfields/Superfund Legislation,” Environmental Law in New York (LexisNexis Dec. 2003 and Jan. 2004). “Accommodating Growth and Development After Guilderland: Is the New York Legislature About to (Re) Act on Impact Fees?” vol. 8, Pace Environmental Law Review, 175, 1990. Mr. Sterthous received a Juris Doctorate and Certificate in Environmental Law from Pace University School of Law, where he was an editor of the Pace Environmental Law Review. He was awarded a Bachelor of Arts in Environmental Science from Eisenhower College of Rochester Institute of Technology.